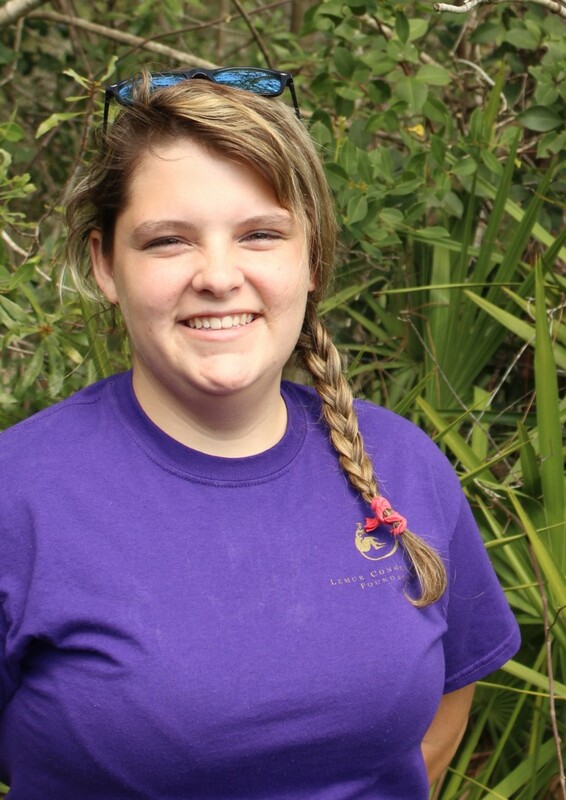 Tiffany comes to LCF from Catawba, NC, where she earned her BS in wildlife rehabilitation at Lees-McRae College. While there, Tiffany cared for injured mountain wildlife at the Blue Ridge Wildlife Institute. She also completed an internship with the Riverbanks Zoo and Gardens in South Carolina, working closely with keepers caring for gorilla, lemurs, tamarins, and several other small mammal species. After graduation, Tiffany interned with the International Crane Foundation in Baraboo, WI, assisting aviculturists in hatching and raising whooping crane chicks to be released in Wisconsin. Wearing a “whooping crane outfit” and using a hand puppet, she helped chicks learn how to find food, to fear predators, and to start flying. Next, as a husbandry intern at LCF, Tiffany discovered how lemurs interact with one another and their environment, much as they would in Madagascar. Promoted to keeper, she still enjoys her husbandry routine but has added more responsibilities, such as veterinary assistance, training, and recordkeeping.